Kryptonian Warrior: Kirk To Be New Robocop? 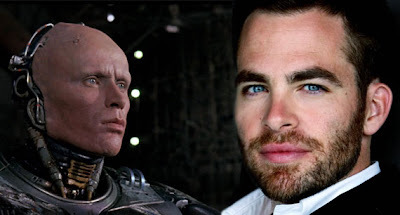 Rumour of the week seems to be that Chris Pine is the top choice for MGM to play the new Alex Murphy/Robocop in the planned reboot. The new film will be directed by Jose Padiha and has no release date as of yet, but as Pine is still relatively young and has become somewhat of a geek-hearthrob through playing Captain James T. Kirk in the JJ Abrams remake of Star Trek there's no denying that the Robocop reboot could well be a very different, but very popular movie!